This post is brought to you by Insurance Hunter. All opinions are 100% my own. Okay, so I have most of my travel plans put together for my trip to Chicago for the BlogHer 2013 conference, except for one really important thing. There is one crucial item on my list that I have yet to deal with, and I needed to do some research to figure out my best options. While researching, I came across this article: Planning Your Dream Vacation from Insurance Hunter, which simply has a quick list of valuable tips about planning your next dream vacation, and yeah, I would totally put Chicago for BlogHer in the dream pile until it finally becomes a reality this July! I’m not expecting anything to happen while I’m in Chicago, other than the incredible amount of knowledge, friendship and fun that I experienced at the last BlogHer conference in New York. But life happens. I actually did need a number of bandaids last year, and nearly broke my ankle while walking in NY. A couple pairs of shoes I wore last year were truly the wrong choices, as one pair gave me blisters that I hadn’t planned on, and the other was my favourite and most comfortable pair of strap wedges I’ve ever owned… but while walking down a pot-hole littered street in Manhattan, one of the main straps broke and I still have no clue how I wasn’t flat on my face just after that happened. I wasn’t sure what bothered me more at that particular moment, the fact that I lost my absolute favourite pair of shoes while twisting my ankle pretty good in the middle of a NY street (crossing traffic,) or the lump that managed to lodge itself in my throat from the thought of, “Oh my gosh, I almost hurt myself badly there.” In Canada, you hear horror stories of the American health system all the time. Heck, some of us might know more about the US system than our own thanks to the warnings and news coverage we’re continually bombarded with. The idea that I might have to step into a US hospital without proper insurance is an extremely scary thought. I need insurance coverage that I can trust, and the quote I received from Insurance Hunter is actually from an insurance company that I happen to trust most. Are you planning on leaving your country for some fun this summer? Would love to know your plans! Girl!!! I can’t wait to see you again! I should definitely look into my travel insurance coverage. Thanks for the reminder. 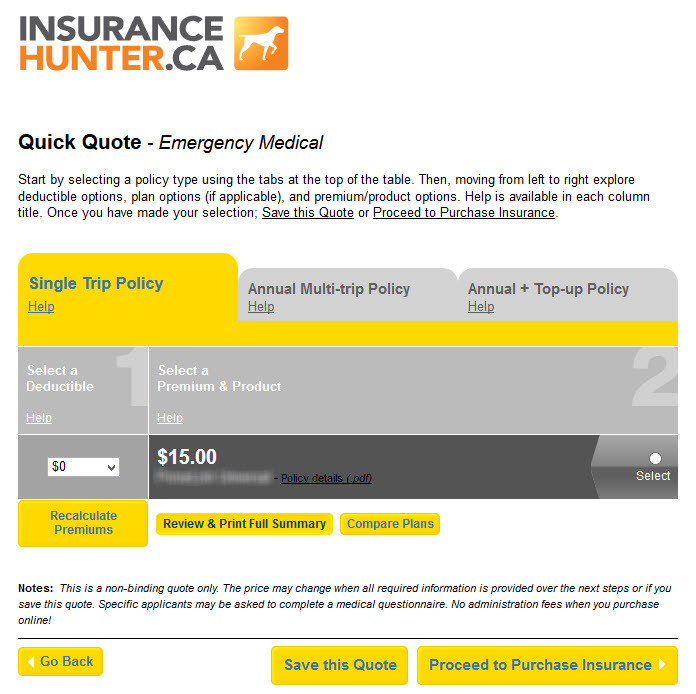 CBC Marketplace did a whole show on travel insurance, really opened my eyes. skeetersden LOL!!! Thank you!! I’m so lazy I haven’t even looked until now, thanks to your link. XD WOW 40 seasons?? I only knew of its current incarnation with Erica Johnson and Tom Harrington.